The San Diego Special Mustang was limited to 200 V6 Mustangs featuring Lemans over-the-top stripes, rear spoiler, upgraded exhaust with chrome tip, chrome spinner wheels, 500W Shaker stereo, interior upgrade package (aluminum dash trim, shift knob, door handles, and door sills), MyColor gauges, and SDS interior and exterior badges. In 2006 this model's name was changed to the Southern California Special. And then in 2007 changed to a GT and called the California Special. This is Devin Gieselman's 2005 Mustang Limited Edition SDS (San Diego Special). It's our featured Attitude Of The Week for the week starting February 2, 2014. Only 200 of these were built in 2005. They start with a V6 Mustang and add Lemans over-the-top stripes, rear spoiler, upgraded exhaust with chrome tips, chrome spinner wheels, 500W Shaker stereo, interior upgrade package, My Color gauges, and SDS interior and exterior badges. Devin has made some modifications to his SDS coupe. Sonic Blue 2005 Mustang SDS coupe owned by Dani Devor from Dan Diego, California. This is our featured Attitude Of The Week for the week starting November 25, 2012. The SDS special edition stands for San Diego Special. They start with a V6 and add the over-the-top dual stripes, a spoiler, and a chrome exhaust tip. 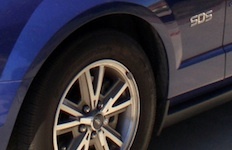 Dani tells us more, "This 2005 Mustang SDS #122 was purchased July 25th in San Diego, California. It was a 16th Birthday Present to huge Ford Mustang and car fanatic, Danielle Devor. All modifications were done by herself; Raxiom smoked 2010 style headlights (featured in only several pictures), Steeda throttle body spacer, BBK Blackout Cold Air Intake, and Flowmaster American Thunder axleback exhaust (not featured in pictures),"
Red Fire 2005 Mustang SDS (San Diego Special) coupe owned by Ronald Proffit from Chandler, Arizona. It has the V6 engine and an automatic transmission. Ronald tells us more, "In December of 2017 we were replacing a Chevy Cobalt(LOL) that had been totaled and we found this on the back lot of a dealer. The Mustang looked good to my wife and she said lets go for it... After we purchased the Mustang, the manager and I drove from Chandler AZ to Avondale AZ to pick it up. As we were looking it over the manger noticed the SDS placards on the side and asked me what those meant? I had no idea so I looked it up and was pleasantly surprised... No one has ever heard of this model here in Az. (hehehehehe) It is 199-200 so it was the second to the last ever made which i think is cool "
This amazing 2005 Sonic Blue Mustang coupe is a San Diego Special limited edition. Offered only in Souther California, it was limited to 200. In 2006 this model's name was changed to the Southern California Special. And then in 2007 changed to a GT and called the California Special. Jon Stinebaugh just bought this car which is number 124 of 200. He found it 20 minutes from his home at an older gentleman's home who kept it in his workshop for 14 year with only 782 miles on it and in mint condition. Amazing.